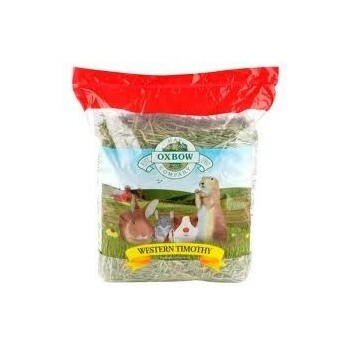 Oxbow Orchard Grass is a green, fruity-smelling grass hay which many small animals enjoy. To the untrained eye, it looks identical to timothy grass, but the seed heads have a different shape. Orchard Grass is a perennial cool season grass with flat leaf blades. The leaves vary in colour from green to bluish-green depending on the maturity of the plant. The lower surface of the leaf is not shiny; and leaf sheaths can be somewhat rougher to the touch than timothy. 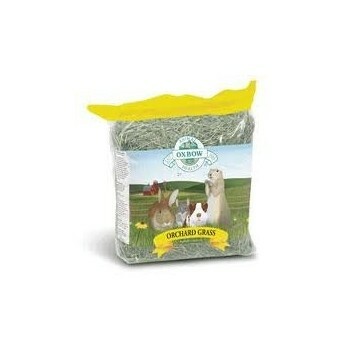 Orchard Grass is recommended by veterinarians for small herbivores due to the nutritional content. Orchard Grass can be mixed with other grass hays when feeding your pet. This is encouraged because animals seem to like the variety. Mixing your grasses will encourage them to eat more hay, which is beneficial to the health of the animal. Hay is absolutely vital to the health of small herbivores. Orchard Grass provides a long-strand fibre source that is needed to improve the digestive and intestinal functions by stimulating the digestive system. When animals are fed free-choice hay, it promotes their natural chewing behaviour, which helps prevent molar spurs and other dental problems that are so common in these small herbivores.